. : Training update, loop time trial, and decaf coffee :: Ski XCOttawa.ca :: Skiing in Ottawa and Gatineau Park :. I'm surrounded by hints that summer is ending soon, but I truly am looking forward to Fall, since I like the crisp weather and each week that brings us closer to snow. Summer training has gone well - I've managed to be fairly consistent with my program, raced some good triathlons, avoided injury, and gradually increased my ski-specific training. A sure sign of the end of summer is the final XC Ottawa "loop time trial," a monthly test to assess progress throughout the summer. This is a long rollerski time trial, consisting of a counter-clockwise loop of the Gatineau Park, which takes 1:05-1:20 for most of us (the guys add the out and back to Champlain Lookout). To keep variables constant, we do this time trial after an easy week of training, and use the same equipment each time to control for rollerski speed. We start at minute intervals, and try to keep a controlled effort (Zone 3) that isn't all out and sustainable for over 1 hour. Most of us have skis of varying speeds, so comparing times with teammates doesn't give much information, but comparing personal times across sessions can be helpful. Alana and Zoe are new to the loop time trials, and seem to be learning a lot from the experience. Here they are ready for the final Loop TT of 2008. These time trials are a good opportunity to refine warmup routines, practice different pacing, and try to figure out what variables influence the outcome - all factors that will help for winter racing. Since overall training volume is typically high during the summer, a slower time than expected isn't necessarily a bad thing, and a good opportunity to reflect on your training routine and racing strategies for the upcoming season. My first time trial in May was slow compared to other years, something I attributed to new wheels that seemed pretty sluggish - and unfortunately I was stuck with them for the season (to keep consistent equipment), which was a bit frustrating at times, but not all bad. Fortunately I saw a gradual decrease in time over the 4 time trials, and yesterday's effort was over a minute faster than last month, so I'll take that as a good sign. I usually do well on the long sustained climbs, and lose time on rolling terrain, flats, and downhills. For this time trial I focussed a lot on going harder over the tops of climbs and into the downhills - I think this helped achieve the faster time. I would probably benefit from a better warmup with more intensity. I usually start to feel and ski technically better after the first half of the time trial. I can perform well without my usual strong morning coffee. This was not a planned test! I realized today that I had been drinking decaf coffee (by mistake) at least all weekend. I developed a headache after the Time Trial that lasted all afternoon and overnight. I finally figured out that I put decaf beans in our coffee canister by mistake, and attribute the headache to caffeine withdrawal (probably not a good thing . . .). I'm looking forward to the next block of Fall training, and especially to training with the new XC Ottawa recruits who will be joining us over the next few weeks. XC Ottawa Coach John Suuronen. Does he smile more before practice when he knows we're going to suffer a little? The first 4km of our course has undergone more "road repair." A sticky black subtance covered with TOILET PAPER (I'm serious - check it out closely), which is very treacherous for roller skiers. The time trial starts at this sign from P8 and finishes on the other side of the road. My heart's reaction to the final Loop Time trial. 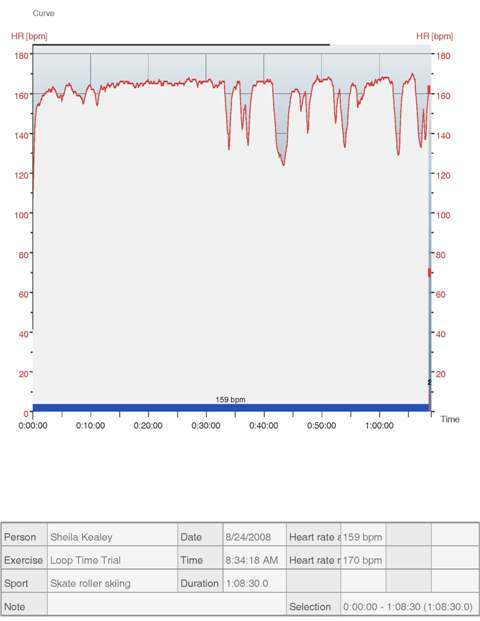 Getting heart rate data is another tool to help assess the time trial and compare to previous loop time trials. Oops! Decaf coffee all weekend. Are the people on the package laughing at me? Athlete Diary: Spring skiing - One Last Hoorah in Labrador!